First open the desired project in the Project Browser. Ensure all relevant tapes and drives have been indexed into that project. SOURCE and COPY indexes will be created automatically if the material was copied using YoYotta. If required filter the items in the Media table. For example it makes sense to Hide Sources as they will probably not contain the material any more. Or select Clone LTFS to just show Safety LTFS tapes. Then open the Conform panel. Drop in one or more conform files. 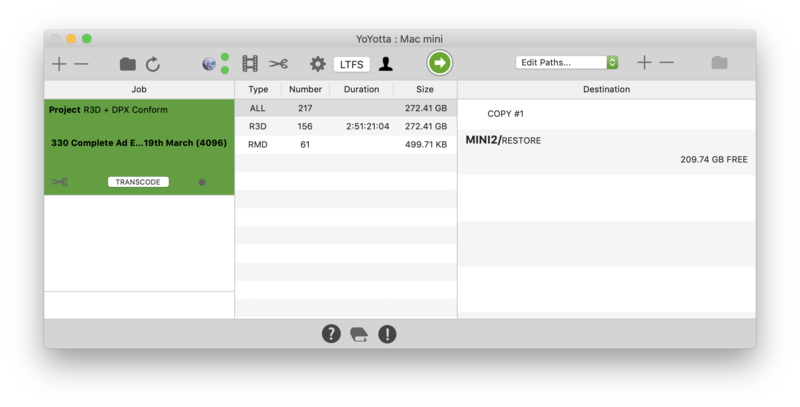 YoYotta Conform supports AAF, ALE, CSV, EDL and FCPX file types. They do not need to be pull lists or with handles as these can be added. You can also drag a folder of EDL files onto the YoYotta icon. This will open the Conform panel and add the EDL to the conform. If any In or Out times show as INVALID or there are no matches check the project frame rate is set correctly and refresh the conform. 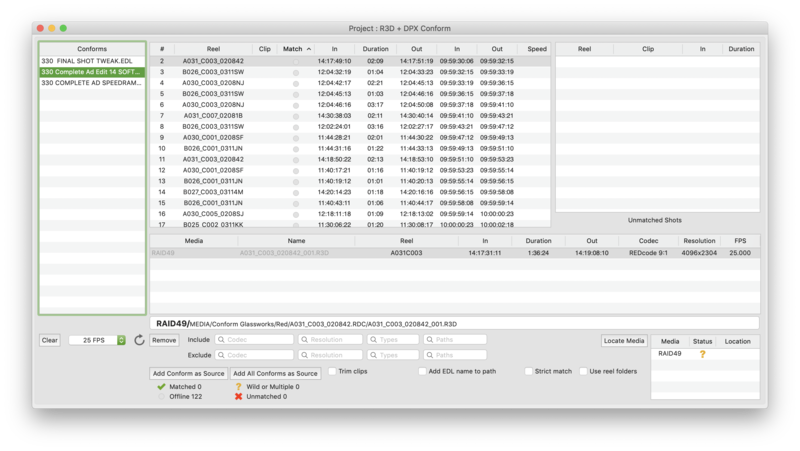 YoYotta searches the media shown in the Project Browser for clips with matching reel and timecode. There is a scrollable timeline showing the conform. Here all 122 shots have been found, but they are offline. On the far right there is a Media table that shows which drives and tapes are needed. The shots are on a drive called DATA12 which needs to be mounted. If nothing is found make sure that all the source media has been indexed into the project. Now the drive with the source material has been found and connected. Refreshing shows 122 Matches. To copy the shots make sure that Trim clips is turned off. Now add the conform to YoYotta by clicking the Add Conform as Source button. If there are multiple Conforms then they can be restored in one job by clicking the Add All Conforms as Source button. If the footage is online (not on tapes) then thumbnails will be created. If the conform is an LTFS restore and it references multiple tapes add then all into a library, click the Add Conform as Source and start the job. If using a single LTO drive load the first tape into a drive, click the Add Conform as Source and start the job. On completion repeat this for each tape. YoYotta creates a virtual source that holds all the clips needed to recreate the conform. Here there are R3D and DPX clips. Choose a destination and consolidate the material into a new folder. Save the paths as a RESTORE preset and YoYotta will automatically use that for restores. If multiple copies are needed then several destinations can be added. Instead of copying the entire clip, YoYotta can trim the files, creating new smaller clips without transcoding. The Conform tool uses the In and Out point from the timeline to reduce the length (and size) of the clip. To do this turn on Trim clips in the Conform panel. This way you can bring raw into grading sessions without the large file size overhead. YoYotta can also make two identical trimmed conforms, one on the RAID and one on an external drive. Again saving huge amounts of time. YoYotta Conform will trim the following formats. Back in the conform panel when trimming you can adjust the handles. YoYotta will extend each edit by this number of frames. So the restored clips will be longer, allowing for small changes in the edit. Filter the clips to include or exclude by codec, resolution, type or path, here only the 1920 or 2048 wide clips will be matched. All the Include filters are required to match with each clip. You can add multiple matches to these filters for Include or Exclude by separating with commas. For example you can include file types R3D or MOV using r3d,mov. 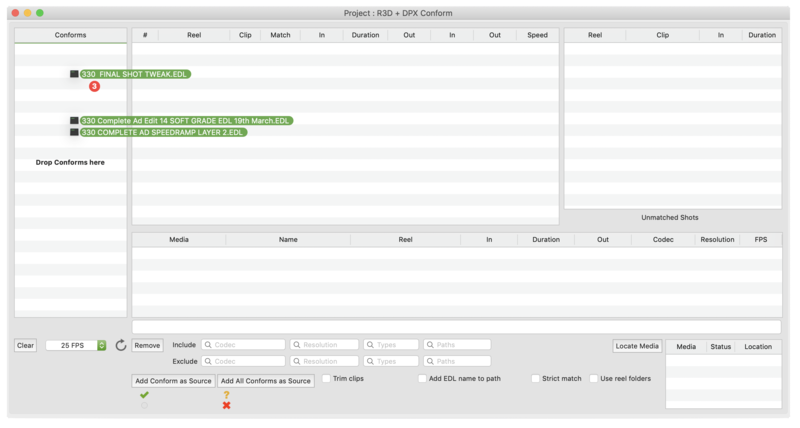 Or include codecs Apple ProRes + ARRIRAW + REDCode, using a filter of prores,arriraw,red. Or can you exclude path1, path2. These filters are not case sensitive. Note that it's quicker to conform if you set up these filters before dropping in your timelines. Choose to trim or copy the required clips. When trimming if several sections are needed from one shot then YoYotta can create separate clips or one merged clip by enabling Merge Clips. With multiple conform lists, the conform name can be added to the path. Optionally add all the source folders to the path. For a VFX workflow the trimmed clips can have the EDL clip name. In this source you can see just the 4K clips. This allows easy copying or trimming specific codecs or resolutions to different destinations. Use the conform as a source for the YoYotta Transcode option. Easily create over-length selects from the source material for online.